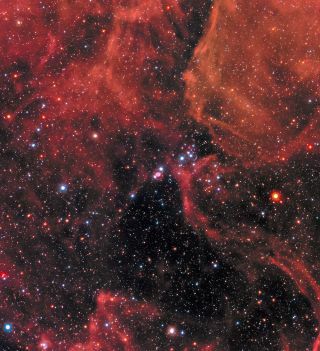 The Hubble Space Telescope shows the luminous explosion of supernova 1987a within the Large Magellanic Cloud, the neighboring galaxy to the Milky Way. On Feb. 23, 1987, the light from a giant, exploding star reached Earth. The event, which took place in the Large Magellanic Cloud, a small galaxy 168,000 light-years away that circles our Milky Way, was the closest supernova to occur in nearly 400 years, and the first since the invention of modern telescopes. More than 30 years later, a team has used X-ray observations and physical simulations to accurately measure the temperature of elements in the gas around the dead star for the first time. As the hyperfast shockwaves from the heart of the supernova slam into atoms in the surrounding gas, they heat those atoms to hundreds of millions of degrees Fahrenheit. When giant stars reach old age, their outer layers slough off and cool into enormous, remnant structures around the star. The star's core creates a spectacular supernova blast, leaving behind either an ultradense neutron star or a black hole. Shock waves from the explosion travel out at one-tenth the speed of light and hit the surrounding gas, heating it up and making it shine in bright X-rays. NASA's space-based Chandra X-ray telescope has been monitoring the emissions from supernova 1987A, as the dead star is known, since the telescope was launched 20 years ago. In that time, supernova 1987A has surprised researchers time and again, David Burrows, a physicist at The Pennsylvania State University and co-author of the new paper, told Live Science. "One big surprise was the discovery of a series of three rings around it," he said. Since around 1997, the shock wave from supernova 1987A has been interacting with the innermost ring, called the equatorial ring, Burrows said. Using Chandra, he and his group have been monitoring the light created by the shock waves as they interact with the equatorial ring in order to learn how the gas and dust in the ring heats up. They wanted to figure out the temperatures of different elements in the material as the shock front engulfs it, a long-standing issue that has been difficult to determine accurately. To help in the measurements, the team created detailed 3D computer simulations of the supernova that disentangled the many processes at play — the speed of the shock wave, the temperature of the gas and the resolution limits of Chandra's instruments. From there, they were able to pin down the temperature of a wide range of elements, from light atoms like nitrogen and oxygen, all the way up to heavy ones like silicon and iron, said Burrows. The temperatures ranged from millions to hundreds of millions of degrees. The findings provide important insights into the dynamics of supernova 1987A and help test models of a specific type of shock front, Jacco Vink, a high-energy astrophysicist at the University of Amsterdam in the Netherlands, who was not involved in the work, told Live Science. Because the charged particles from the blast are not hitting atoms in the surrounding gas, but rather scatter the gas atoms using electric and magnetic fields, this shock is known as a collisionless shock, he added. The process is common throughout the universe, and so understanding it better would help researchers with other phenomena, such as the solar wind's interaction with interstellar material and cosmological simulations about the formation of large-scale structure in the universe.